Limiting our exposure to fumes and filings is an understandable area of concern for many nail techs. Even techs who primarily offer natural nail services are exposed to pungent chemicals in traditional polish, gel-polish, and acetone, and to the dust that comes from manicures and pedicures. Techs who choose the protection of a face mask may face apprehension from clients who wonder why you’re being protected, but they are left exposed. Let’s see how we could talk to them to help ease their worried minds. Client: What made you decide to start wearing a mask? You: When I saw how much dust was on my clothes by mid-afternoon, I knew I must inhale a lot of it. Over the course of the day, I may see 10 clients, so that’s a lot of dust. I’ve known nail techs who have become allergic to the products they use simply because they have so much exposure. I don’t want that to happen to me, so I’ve been reading about ways I can reduce my exposure while I’m at work, and the mask seems like a really smart move. 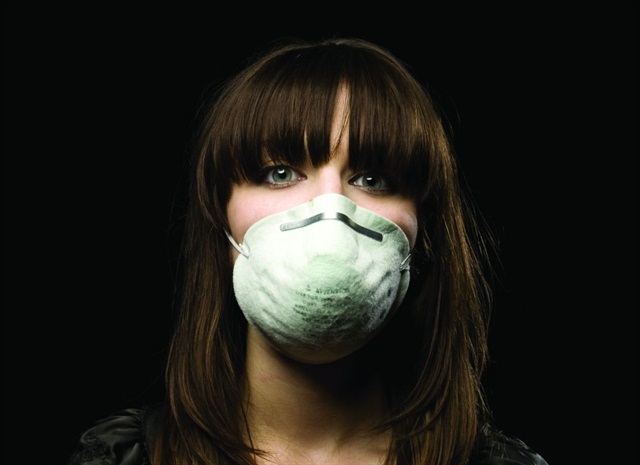 It’s also a good way to guard against potential respiratory problems that could develop. It’s preventative more than anything. Client: Do you wear the mask for only the dust or also because of the smell? You: Not for the smell at all. It’s not the smell that presents a problem; think of dirty socks or eggs. The smell is unpleasant, but not dangerous. I wear it for the dust and vapors. Even though OSHA says the vapors aren’t dangerous because our exposure to the products is well below the permissible limits, I thought there’s no harm in wearing the mask. If I were going to a salon as a client, I wouldn’t worry about it at all — a client doesn’t bend over the nails and inhale all the vapors the way a tech does. Plus, clients are here for such a short time any risk is negligible. When I first started wearing the mask, clients thought I had changed products. New clients thought maybe I was using something harsher than what is used by techs who don’t wear masks. Neither is true; it’s more an issue of “the more you know.” As I learned about the potential problems with repeated and prolonged exposure, I thought it would be best to take steps to protect my breathing zone. Client: Is a mask enough protection? You: Actually, this issue has made me reassess changes for the whole salon, too. The vapors of the enhancement products are heavier than air, so they fall to the floor. That means the HVAC air filtering system alone doesn’t keep the air as clean as it could be. So, I’m looking into desk filters that remove dust, filings, and fumes right here at the source. The best ones ventilate to the outside, so I’m still researching my options. Until then, we take precautions to reduce vapors in the salon by keeping all of our chemicals covered. We use covered dispensers for liquids rather than the traditional dappen dishes, and we put all our acetone-soaked cotton balls in a sealable plastic bag before disposing of them in a covered garbage can. I’m also using a salon HEPA filter, which we use all day and turn on high each night, to eliminate some of the vapors and dust in the air. It’s our way of protecting our clients and ourselves.